Archaeologists are embarking on an excavation at the site of one of the earliest legal whisky distilleries in Scotland, dating back to 1825. 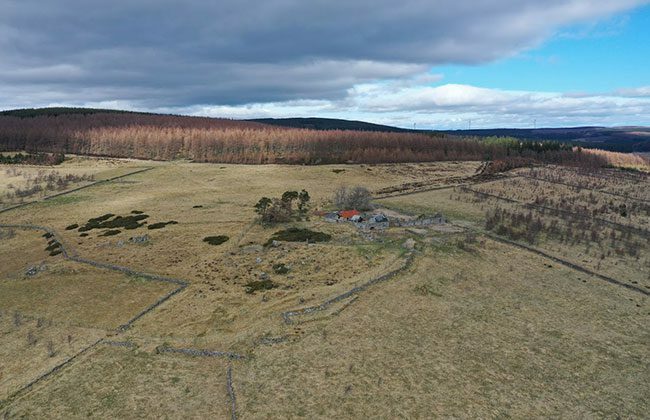 The Cabrach Trust is leading the dig, which is taking place from 8-11 April at Blackmiddens, a ruined steading in the Cabrach parish on the border between Moray and Aberdeenshire. It marks the first excavation of a traditional small farm distillery. The farm was one of the first to be granted a licence to produce whisky following the introduction of the 1823 Excise Act, which legalised small-scale distilling. “The Cabrach is a place of many secrets. For decades local farmers secretly distilled whisky and smuggled it away under the noses of excisemen,” said Anna Brennand, chief executive of the Cabrach Trust, which was established to preserve the history of an area notorious for illegal whisky distillation and smuggling. Researchers believe the farm would have used a 180-litre (40-gallon) still – much smaller than today’s stills that can hold thousands of litres. It produced whisky for eight years, from 1825-1833, after which the farm fell into ruin. The excavation will allow archaeologists to record the character and size of the visible remains, and explore the relationship between the distillery and the farm steading. Joan Harvey, 66, said her great, great uncle, James Sharp, was a tenant farmer at Blackmiddens and a ringleader of a whisky smuggling gang. “Apparently my great, great grandfather had a white stallion and when the excisemen were billeted locally he would ride his white horse, alerting everyone that the excisemen were there so that the whisky smugglers could go to ground,” she said. “I was also told that, one time, the excisemen were trying to catch the smugglers and had set up barricades all around Aberdeen. My great, great uncle hired a horse-drawn hearse and loaded the coffin with whisky. Historic illicit stills can be found throughout the Scottish Highlands, but are particularly common in Cabrach. When the Excise Act was amended in 1823, illicit distillers came down from the hills and set up production in farmsteads. The dig has been supported with funding and assistance from Forestry and Land Scotland, which manages Blackmiddens, and Historic Environment Scotland.